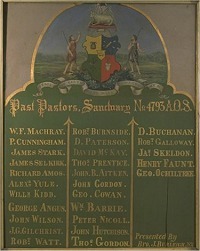 Shepherds were a distinctive variation within the affiliated or unity friendly society sector of the nineteenth century. They were a sickness and benefit society very similar to all the others. They drew their mythology from biblical sources, emphasising pastoral aspects of mutuality that could be exercised for and by members by the lodge. As with all these organisations the generic term hides several organisations. In the early 19th century the Royal Shepherd Sanctuary Benefit Society was established in Yorkshire. In 1826 an 'Ashton Unity' began to spread from Ashton-Under-Lyne near Manchester and had soon established branches country-wide. However, in the Lothians and Fife their lodges existed alongside those of another organisation, the Ancient Order of Shepherds. The Ashton Unity was founded in Ashton-Under-Lyne, England, in 1826 and lodges were open in Scotland by 1868. They appeared in the Edinburgh area during 1876 and soon had had premises in James Hall, Pilrig Street, Edinburgh (by 1885). By the opening of the 20th century were firmly established at Shepherd's Hall, 1 India Buildings, where they remained for most of the century. At its peak around 1910 the Edinburgh District included at least 39 lodges throughout Fife, the Lothians and Berwickshire. It then boasted nearly 6000 adult and over 2000 juvenile members. In 1960 there were still 11 working lodges. 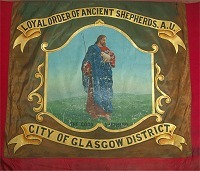 The society changed its name to simply the Shepherds' Friendly Society in the 1990s and the Edinburgh and Leith District was still functioning into the 21st century. Members wore shepherd's plaids, usually a black and white wool check pattern secured by a brooch and carried crooks. In Scotland, at least, large (gray or white) wool bunnets were typically worn, often with a feather. The Ancient Order opened offices in Edinburgh in the 1890s and last appeared with an address at the Sons of Temperance Hall, High Street during the first world war. The branches of this Order can be distinguished readily by the use of the term 'Sanctuary' to describe them, rather than 'lodge', as used by the Ashton Unity. Thus, the Haddington branch was described as Sanctuary No 4793 Lamp of Lothian when it opened in 1876. Others were Sanctuary No 5257 Edinburgh and Sanctuary No 4981 Robin Hood of Leith. Associated with the Ancient Order of Foresters, there was one Sanctuary of Shepherds in every District of the Foresters. Officers wore gowns and mortarboard hats adapted from academic dress. In addition to the standard shepherd's crook, some officers carried poles with a representation of an owl (knowledge), a palm, a globe and other symbols. Short staffs and batons, or perhaps paper scrolls are also evident in old photographs. Ordinary members wore sashes and a few members might possess a Masonic-style apron.